GPS located and Type Specific Monitoring Station Icons. Alarm Status Button – Allows the user to immediately know if there are any issues with their monitoring stations. HMI screen provides options to view all data and metadata – pictures; monitoring station setup information; site maintenance information; and data logger channel and alarming parameters. GoMaps is an excellent place to start when first logged into your project. It gives the user an immediate visual confirmation of monitoring station status. GoData is a web-based data acquisition, alarming, and management platform. 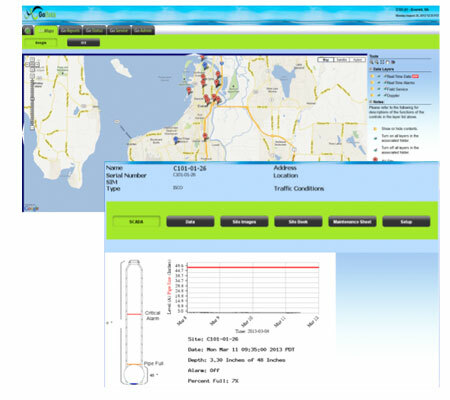 Users can access, analyze, and export all their important environmental monitoring data from various sources within their own system. The GoData platform readily accepts data from flow meters, data loggers, SCADA systems, RTU/PLC, and is compatible with most major manufacturers’ equipment. Data and alarm notifications can be accessed from any computer, smart phone, or tablet device. GoData is the way to access all your data, where you want it and when you need it. SFE GLOBAL (SFE) is a municipal and industrial service company specializing in underground infrastructure assessment, monitoring, and environmental data management.